You are here: Home › Blog › Why designate Keauhou as a water management area? Why designate Keauhou as a water management area? Protect Kona’s freshwater! 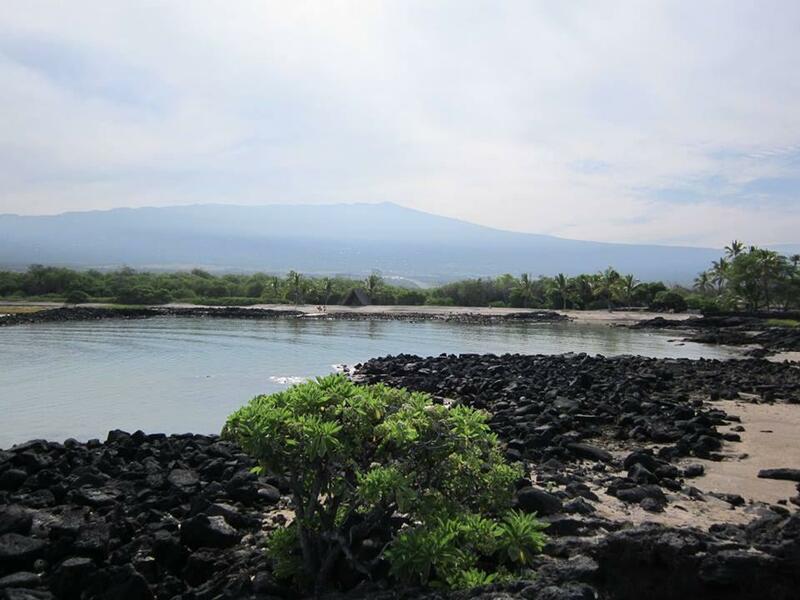 KAHEA supports the National Park Services’ petition requesting the state Commission on Water Resource Management (CWRM) to designate the Keauhou aquifer in Kona as a “ground water management area” (WMA). WMA designation would protect freshwater resources and the rights of communities and Hawaiian practitioners in those resources. Protect Kona’s freshwater! KAHEA supports the National Park Services’ petition requesting the state Commission on Water Resource Management (CWRM) to designate the Keauhou aquifer in Kona as a “ground water management area” (WMA). WMA designation would protect freshwater resources and the rights of communities and Hawaiian practitioners in those resources. Hawaiian histories of Kona and the legal scheme of the state water code clarify how WMA designation would work and why it is needed in Keauhou. Seemingly barren and dry, Kona harbors underground rivers that sustain coastal fisheries, fishponds, anchialine ponds, and communities that depend on those resources. Ancient Hawaiians recognized the importance of this place and determined to settle on the makai portions of Kohana‘iki, Kaloko, Honokoahu, and Kealakehe ahupua‘a. Troubled by rampant development in the early 1970s, Hawaiian communities of the area successfully organized and lobbied the U.S. Congress to protect Kaloko-Honokōhau. U.S. Representative Patsy Mink worked with the Hawaiian Civic Clubs to convene a Commission to put together a proposal for establishing a national park. In 1974, Fred Cachola, Herbert Kane, Arthur Chun, ‘Iolani Luahine, David Kahelemauna Roy, Pilipo Springer, George Pinehaka, George Naope, Abbie Napeahi, and Emily Ka‘ai Thomas wrote the “Spirit of Kaloko-Honokōhau,” which recommended establishing Kaloko-Honokōhau as a sanctuary for Hawaiian cultural practices. More than 40 years later, the vision of the Spirit Report is living as communities continue aloha ‘āina at the fishponds at Kaloko-Honokōhau and across Kona. Fred Cachola offered this presentation on the way Kaloko-Honokōhau became a national park. 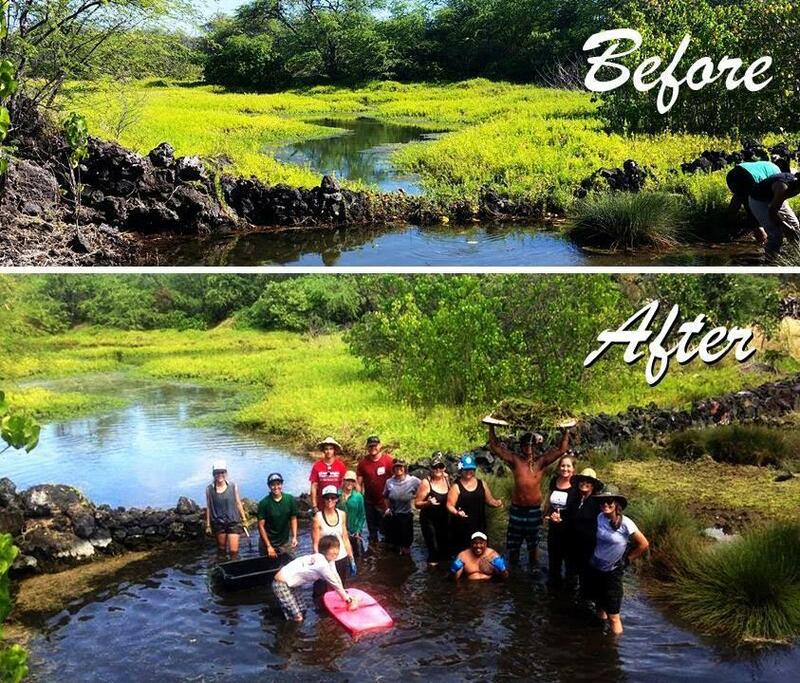 October 2015 Aloha ʻĀina workday participants. The Spirit Report authors emphasized protection of freshwater in order to maintain cultural practices, stating: Good water quality is essential to fishpond culture, and since the source is almost entirely in the rainy mauka areas, management of these and other lands adjacent to the park will have a direct impact on water resources within the park. Thus, cooperative planning efforts with the state, county, and private landowners is an important part of this proposal. Currently, several residential and commercial developments, including wells, are planned for areas mauka of Kaloko-Honokōhau Park. Withdrawing freshwater in mauka areas leaves less water in flows to the coast. Further south in Keauhou aquifer, chlorides exceeding drinking water levels have been pumped from the Kahalu‘u well. Higher chloride concentrations can occur where over-pumping caused oceanic water to move further inland. In 2011, the Kona Hawaiian Civic Clubs adopted Resolution 11-40, urging the state and county to protect the sustainability of Kona’s fresh groundwater aquifers in view of increasing development. As foreseen by Spirit Report authors, protecting water and makai cultural resources will require cooperating with the state, county, and private landowners. The state water code (Hawaii Revised Statutes, chapter 174C) has separate laws governing water resources within and without WMAs. In all aquifers, water developers apply for well installation permits, register their wells, and report their monthly water usage. Water developers include the county, private subdivision developers, Department of Hawaiian Home Lands (DHHL), and other well drillers and diverters. Unlike other water users, DHHL may reserve water to itself, and has already done so in the Keauhou aquifer. In WMAs, they must apply for water use permits. To obtain a permit, applicants must show their water uses will not interfere with the rights of DHHL, existing water users, or Hawaiian traditional and customary uses, and that their water uses can be accommodated from water sources, and water will be put to reasonable and beneficial purposes. WMA permits and public hearings are mechanisms for enforcing protections for community and Hawaiian cultural uses of water. Outside of WMAs, water use permits are not required. Instead, water developers only apply for permits to install wells, no public hearing is required, and neither the state nor county can control the placement of the wells. Well placement is important pumping clustered too closely may compromise the freshwater lens. If too much groundwater is drawn too quickly, the freshwater lens of water can be destroyed or depleted. Ten other groundwater WMAs have been designated: all but the Wai‘anae aquifer system on O‘ahu, all Moloka‘i, and the ‘Īao aquifer on Maui. Designating the Keauhou aquifer as a WMA would impose a more comprehensive water protection scheme, in which the impacts of different amounts and locations of water withdrawals would be publicly disclosed and assessed. View of ‘Aimakapā fishpond from ʻAiʻōpio fishtrap. In 2013, the National Park Service petitioned for Keauhou WMA designation (see FAQ here) the county, many developers, realtors, and others opposed WMA designation, primarily because they argue: permitting processes would stall development; and there is more than enough water for development. Reported pumpage is approximately 15 million gallons per day (mgd) and the sustainable yield trigger for Keauhou aquifer is 38 mgd. Yet, the sustainable yield trigger does not take into account underreporting, impacts on coastal ecosystems, and the ways too-close well placement can damage the aquifer. Permitting all existing uses may take up to a year, after which new uses could get in line for permits. Because permitting is a public process, certain people could “contest” permits in a court-like proceeding called a “contested case” hearing. In Maui, where not enough water was left to be allocated, these contested cases took many years to resolve. If CWRM starts managing the water now, there will likely be fewer contests because, currently, the amount of water reportedly used is below the sustainable yield trigger. If we wait until there are only scraps left, we’re going to see scraps. CWRM will be receiving two presentations at its May 19, 2016 meeting in Kona at 10am on: (1) Native Hawaiian traditional and customary uses of water at Kaloko-Honokōhau National park; and, (2) why water is needed at existing flow levels to sustain natural resources in and around the park. Come! No decisions are being made about whether to grant the WMA petition at this meeting, but we will keep you updated.